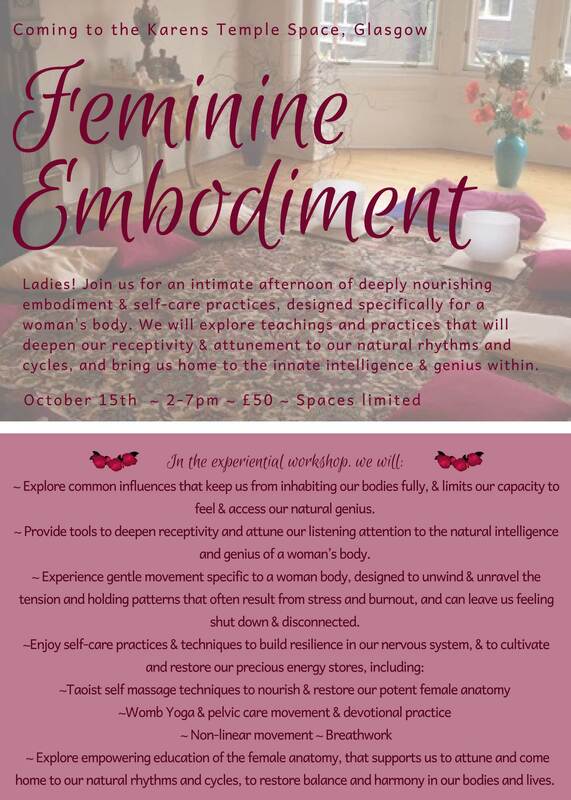 We are delighted to offer this wonderful Feminine Embodiment Women’s Workshop Saturday 13 October with Kay Balavanes. 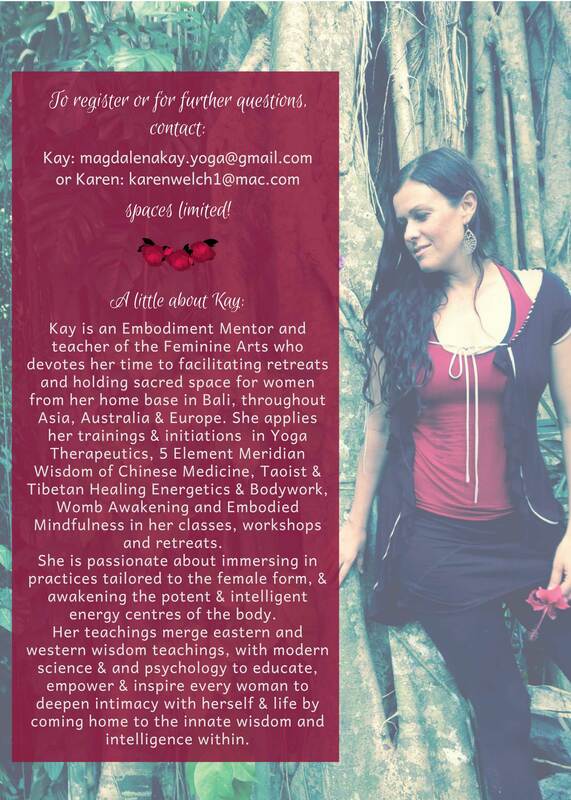 Kay is an Embodiment Mentor and teacher of the Feminine Arts based in Bali who works with women in Asia, Australia & Europe. She applies her trainings & initiations in Yoga Therapeutics, 5 Element Meridian Wisdom of Chinese Medicine, Taoist & Tibetan Healing Energetics & Bodywork, Womb Awakening and Embodied Mindfulness in her classes, workshops and retreats. The aim is to gently unravel some of the stress we are all carrying. This may include breath work, Shakti banda and womb receptivity cultivation practice. What this means in reality is starting with the denser feelings in your body and moving to subtler layers of feeling as we journey into the womb. Kay is passionate about practices tailored to the female form to awaken the potent & intelligent energy centres of the body. 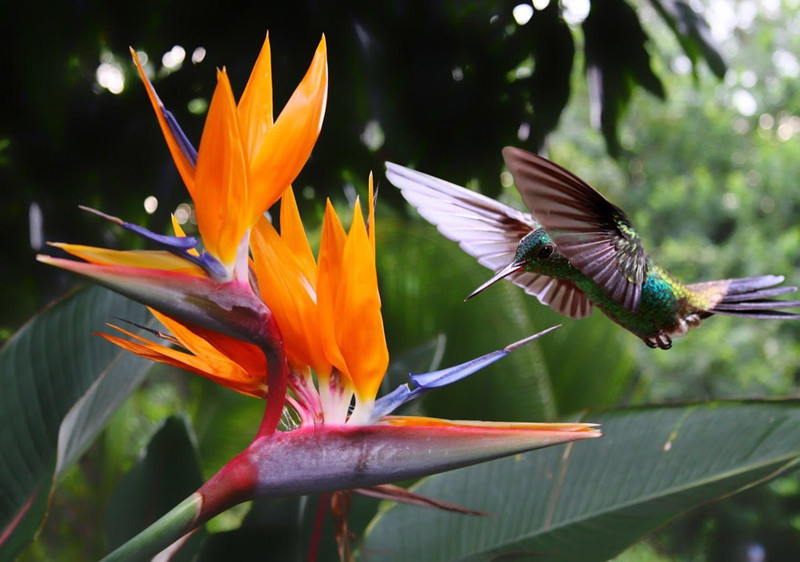 Her teachings merge eastern and western wisdom teachings, with modern science & and psychology to educate, empower & inspire every woman to deepen intimacy with herself & her life. The workshop will be in Hyndland Glasgow on Saturday October 13 from 14.00- 19.00 and costs £50. If you are interested and would like more information or to reserve your place please contact Karen for more information.